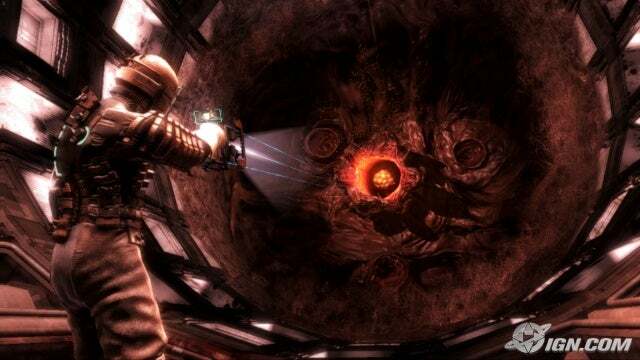 Dead Space was a survival-horror game released in 2008. It received critical acclaim for its utilization of different aspects of a wide variety of previous horror games to create an experience unlike any other game. Unfortunately, despite using all those ideas, it fails to use any of them to become truly outstanding. The fact is that while the game has everything in place for a fantastic, albeit familiar experience, it doesn't manage to truly understand how they all work and are effective. We can start with the story. This is easily the most common complaint against the game. The primary focus of the game is that it starts with you knowing nothing about what happened on the ship you're on. This is still one of the most common traits of a horror game. Start it with a mystery that the player knows nothing about so that the enemy seems more mysterious and the player does not understand him. As we've seen in real life most commonly by some of the more aggressive supporters of wars overseas, people fear that which they don't understand. This is more or less done to a satisfactory degree, but at the exact same time, it isn't supported by the poorly written and uninteresting script. There are moments where it just seems like a joke more than anything else. Then there's the subplot between the protagonist, Issac, and his girlfriend. Obviously we do not care about her, we don't know her. Therefore, the writers should have been attempting to evoke some sympathy from the players. They should feel bad about Issac losing his girlfriend, and want to meet her, if only to see him satisfied from her rescue. The problem is, we cannot feel sympathy for Issac. He has no personality, he never speaks, we never see him. He is a blank slate who has no connection to the player other than acting as their avatar as they progress. There are games where silent protagonists can be useful, but if the other characters are not being met at the same time as the player, or the player feels sympathy and appreciation of those characters, the whole concept falls a bit flat in terms of forming relationships. Next, the gameplay. 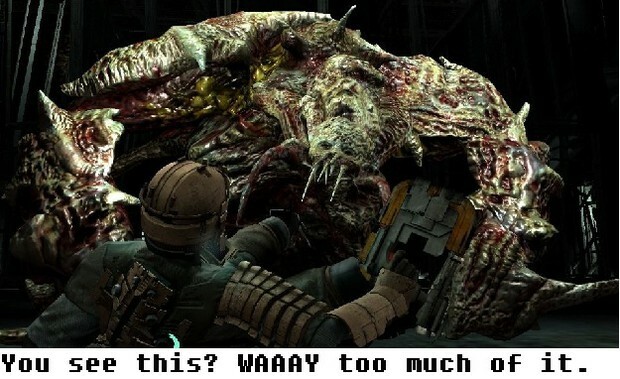 This was considered one of the more highlighted aspects of Dead Space. 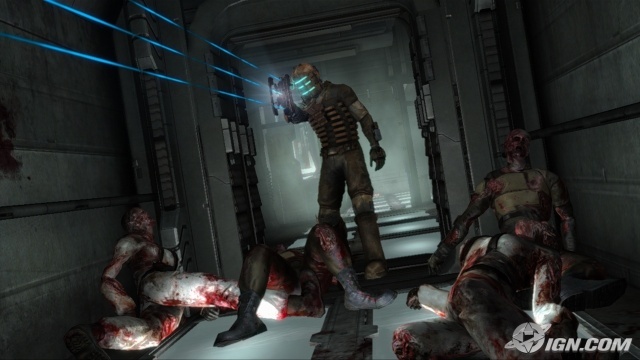 While most horror games focus on shooting anywhere on the body, specifically the head, Dead Space utilizes weaponry that are designed to shoot limbs. This brings up a refreshing change of pace. Instead of shooting wildly, players were encouraged to shoot the parts of the body that would be most likely wailing about as they rush towards you in anticipation of tearing you apart. Unfortunately, they rely on this concept a bit too much. It gets repetitive far too quickly, and they don't do a very good job of introducing new enemies on a regular basis. This isn't helped by stasis being easy to use and feeling overpowered. Enemies that were normally hard and challenging to take down, felt like a cakewalk with it. Also, the game doesn't do a good job of making the player feel rewarded for succeeding in doing damage. While Resident Evil 4 might still have a sketchy status in terms of being a quality horror game in hindsight, it managed to stay fresh throughout its long playtime thanks to its wide variety of set pieces, and satisfying combat. There was a satisfying mix of both horror and bloody satisfactory feedback. And they still managed to come up with new and interesting ways of changing the enemies in presentation, defense, and weapons. Now comes the most problematic part of the game: the atmosphere. Ironically, the thing that most reviews seemed to appreciate about the game falls a bit flat. Simply put, the game is all conflict, but no buildup. If you want to scare players with monsters, but only have 2 or 3 of them at once, you can't simply have them show up and even let the players see them before said monsters start attacking them. You need to allude to their existence and build up what they do and are capable of first. Furthermore, don't always use screeching and bellowing music all the time. Using genuinely creepy music that feels sad and mournful can have just as much as an effect. The problem was that the game felt like it was all action and thriller, but tried to present itself as a true-form chilling horror game, and to that extent, it fell flat. The sad thing is, after all that there was still some potential for a great horror game. The main control scheme was more or less solid, and the new ideas, including the zero-gravity effect and timed vacuum sequences, had some genuinely memorable moments of scary thrills and creativity. For all intents and purposes, had the fundamentals been better, Dead Space could have been able to stand with the likes of Resident Evil 4, Left 4 Dead, or Silent Hill. But as is, its a rent-worthy experience that only stands to sadden that it could have been truly great.